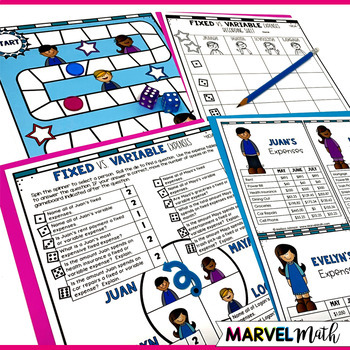 This set of 3 No-Prep Personal Financial Literacy Games is perfect for guided math stations and covers the 4th grade TEKS: 4.10A, 4.10B & 4.10E. In these fun & engaging games students will Calculate Profit, distinguish between Fixed and Variable Expenses and learn the Basic Purpose and Function of Financial Institutions. There are 6 fun & engaging games inside and I have included both color and blackline versions of each. 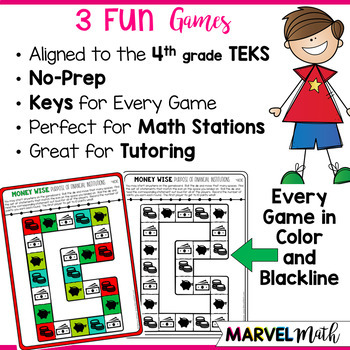 Each game also includes a key, so that students have a self-checking math station. Since practice makes permanent, we want to make sure they are practicing correctly! 1. Calculating Profit - Students are given a list of expenses to create an item and spin to find the selling price. Students compete against each other to earn the most profit. This game also comes with a student recording sheet. 2. Fixed vs. Variable Expenses - Students spin to land on one of 4 people, then find that person's expense card. Students roll a die to find a question to answer. Answers can be checked with the key. The questions vary in difficulty and each one is assigned 1-3 spaces to be moved on the game board for a correct response. This game includes a student recording sheet. 3. 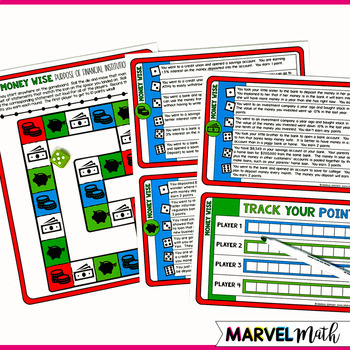 Money Wise - This game is designed to teach and expose students to the purpose of financial institutions, including banks, credit unions, savings & loan companies and investment companies. Students will read scenarios to learn a variety of ways financial institutions help people and businesses. Students earn points based on how beneficial the action taken in the scenario was. 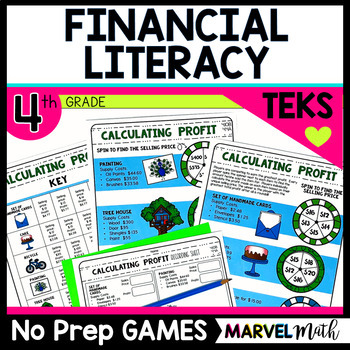 This resource works perfectly with my other financial literacy resources!